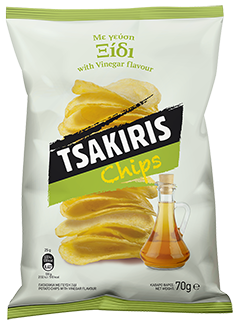 George Tsakiris created his first Potato Chips production unit in the basement of his home in Athens in 1954. The equipment included simple and everyday devices. The potatoes were but by hand and the Chips were fried in a small coal powered fryer. The Chips were packaged in transparent bags by hand. Mr Tsakiris distributed his products to the local open-air cinemas and bakeries before officially launching his company. The company grew gradually, but by the early 1960s, the workshop production moved to a larger space, an electric drive with two knives for cutting the Potato Chips was purchased, and the Chips began production in a large oil burner fryer. Distribution expanded, and three wheeled motorcycle sidecars were used. 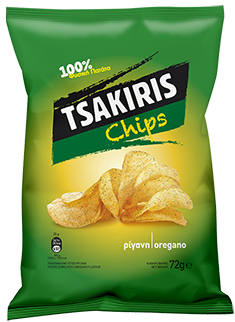 Before the end of the decade, Tsakiris Chips transferred the production facility to Gazi. A full production line was introduced. The machinery included automated slicing, frying and packaging machinery. 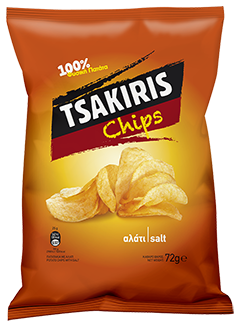 Tsakiris Chips moved to van distribution, which took in marketing via kiosks. These advancements and company progression continued apace, and in 2004 Tsakiris was purchased by Coca Cola.